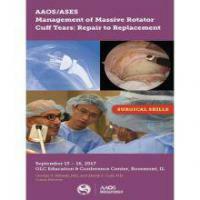 Enhance your surgical skills for managing massive rotator cuff tears. This 2-day, hands-on course focuses on the latest techniques in the management of patients with massive rotator cuff tears. Learn a wide range of treatment options including arthroscopic repair, patch reconstructions, tendon transfers, and arthroplasty. You’ll spend the majority of the course in the cadaver lab practicing and refining these procedures and reviewing equipment applications as they relate to your practice.